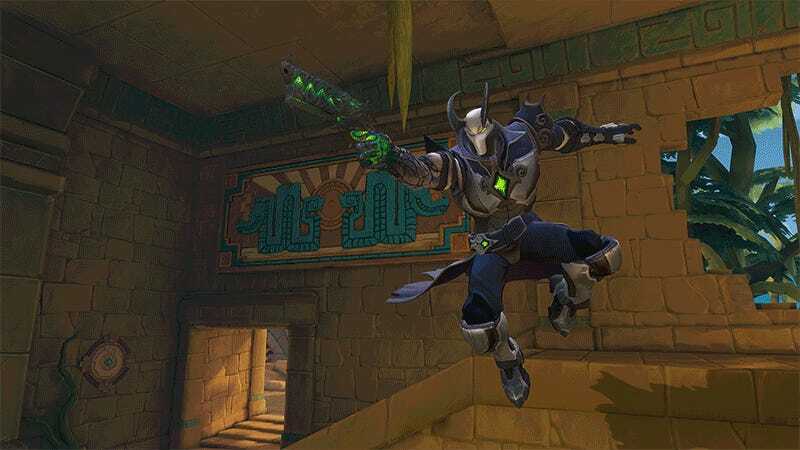 Hi-Rez Studios’ free-to-play hero shooter Paladins enters open beta today, and while its collectible card-based character customization system sets it apart from other games in the genre, Androxus here is pretty much Reaper with horns. I was putting together a little rotator GIF for the top of the post, planning to talk about what is different about Paladins, but that damn Androxus image kept popping up, and I kept typing Overwatch. It’s a fair comparison. Both are character-centric team-based shooters, with heroes that look like Blizzard could have designed them, battling in objective-based game modes. The difference is customization. Paladins features a collectible card system that allows players to create a customized loadout of abilities and modifiers. Cards are found in chests earned through progression or purchase. Originally the cards were a choice given players during matches, but since my initial impressions they’ve been changed to always-on mods, with a separate item purchase mechanic within matches. It’s quite fun, really. Not as tight as other games you may have watched over, but wonderfully playable. The Paladins open beta is now available on Steam for free, along with a Founder’s Pack (currently $13.39) that will give players a bunch of chests to open and access to every champion released for the game until the end of time.